Everytime I make a boot disk, it got me to the music screen and then die. When I hit play, it doesn't play either. What am I doing wrong ? I use Sony brand CD-R to make this. "I've extracted the dreamsnes.0.9.8 zip file. I put the roms I want inside 'cd\rom'. I have the IP.BIN in the 'cd' directory, as well. Using BootDreams, I choose to select a BDS image. I burn with a .cdi and select the 'cd' folder. I select the .bds image that LyingWake gave us. I select 1dsnes.sh4. It burns the image. 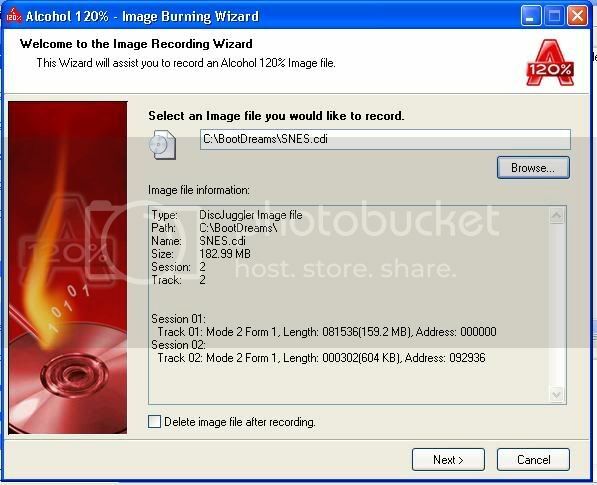 I open Alcohol 120%, choose to Burn Image, go through the wizard without changing settings aside from making it burn at 12x (as shown on the burning walkthrough he provides, he has 12x selected) and burn the CD. After this, the CD does not read in my Dreamcast." ***Please help me. I know I am sooo close to completing this disc. I have an identicle scenario as what I have quoted above. I know everything is right. I did not get any errors, I thought for sure that after 10 coasters with other methods, this was it. After I finished the boot disc with NO problems at all, it did not read in my dreamcast. I have the same dreamcast as the person quoted as well. He said he finally solved the problem with selfboot. So I tried to use self boot in place of the bootfreams step to create the image. After I set it properly it tells me "no such file or directory invalid node." WT*!?! I know the address is correct. PLEASE somebody help me out. I know I am so close. Thank you. LyingWake wrote: OPTIONAL: For the ROM list to load quicker (by not reading each ROMs header for the game's title) you can use a ROM list creator. You can use Provlist by burnerO. You must place it in the roms directory prior to running (make sure your ROMs are in this directory). Use it at your own risk! There has been cases where people have ran this tool in a system folder, renaming all system files. Be warned that the renaming can not be undone! Someone sticky this tutorial ? 17:43:50 Arquivo de Imagem Carregado! S:KEY - 05/26/00 - "Invalid Field In Parameter List"
17:45:22 (F:) HL-DT-ST DVDRAM GSA-4163B(1:0): Grava? ?o Falhou! 17:45:24 Ocorreu algum problema com a Grava??o! Por favor, cheque o arquivo de log e reporte qualquer erro ao Suporte T?cnico. I'm folling all steps, an i do know wht can do? Sorry about my bad english and tank for the attention !!! Here's a fix for that. Mmm well I still love you but I have another problem..now it just says "There was an error creating the DiscJuggler image." I tried using the pike selfboot like I did the past two time's making this work, but since Service pack 2 I haven't had any luck with anything. insidious wrote: Mmm well I still love you but I have another problem..now it just says "There was an error creating the DiscJuggler image." Then, there's gotta be a problem running bin2boot. If you can, open up command prompt, 'change-directory' to C:\BootDreams\tools and type bin2boot.exe. What does it say? An alternative to creating a DiscJuggler image, you can use the CDRecord GUI since the selfboot tool seems to create the ISO just fine, the CDRecord GUI skips using bin2boot and burns the ISOs directly to a disc. You may have to install an ASPI driver - the project page for BootDreams contains a download for one if you do need one. Not quite sure what you're saying..Are you trying to change the output directory? Oh well, I'll just try the cdrecord.. Does this explain my problem any more? I tried running one of the other selfboot things and got this...it was creating the ISO but right at the end it deleted it and this showed up in the cmd prompt. insidious wrote: Does this explain my problem any more? I tried running one of the other selfboot things and got this...it was creating the ISO but right at the end it deleted it and this showed up in the cmd prompt. Very odd. Does BootDreams give you the same error? Do you get any problems when trying to use the CDRecord GUI? Hmm...odd..I tried using CDRecord before, it didn't work...said something about the ASPI drivers (which I had already updated). I just now tried again and I think it's working. I also tried the script on the main dreamsnes page but it would just lock up. I'll let you know if this works. insidious wrote: Not quite sure what you're saying..Are you trying to change the output directory? Oh well, I'll just try the cdrecord..
when you open it, it should come up with a 2tone screen (usually white text on black background, but not always) and down at the bottom it should say something along the lines of "C:\BLAH\BLAH\BLAH>"
so, whats up, am i just F***ING STUPID!! !